Now, more than ever, we need leaders in healthcare who are well-versed in all aspects of leadership. Unfortunately, the skills that made healthcare leaders successful in the past may not be enough to be successful in the future. Managing change requires a very special set of skills and abilities. 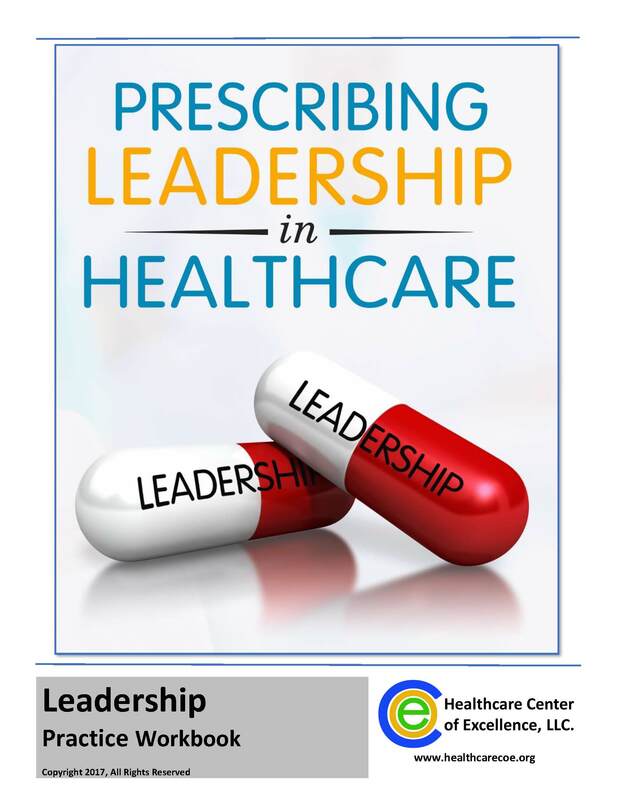 "Prescribing Leadership in Healthcare" is based on the proprietary 5-step Professional Leadership Process which is a personalized, leadership development program based on an individual’s innate qualities and strengths. It is designed as a continually improving process to help leaders develop and adapt a personalized leadership vision and philosophy for utilization in their daily leadership routine. It creates better leaders by incorporating the most often overlooked steps that research indicates are essential to better leadership development. Additionally, it includes the leadership perspectives from several healthcare executives, business executives and sports champions. Order today and receive your copy signed by Professor Bennett! With Foreword written by Chris Van Gorder (President & CEO, Scripps Health). Healthcare has been undergoing significant changes in recent years with more expected well into the foreseeable future. Now, more than ever, we need leaders who are well-versed in all aspects of leadership. Unfortunately, the skills that made healthcare leaders successful in the past may not be enough to be successful in the future. Managing change requires a very special set of skills. Project management, lean six sigma and other change processes all identify leadership as a key critical success factor. In fact, a recent study by the Healthcare Center for Excellence revealed that lack of leadership was the greatest challenge to implementing healthcare analytics. More alarming was the fact that those in leadership positions did not recognize their role in the change management process. Added to this is the confusing advice on what is needed to be a good leader, when, in actuality, all that is needed is for the leader to be them self. Leadership is a process that must be prescribed and practiced every day. It is the same way professional athletes worldwide have followed their prescribed training regimen to improve their already exceptional abilities. 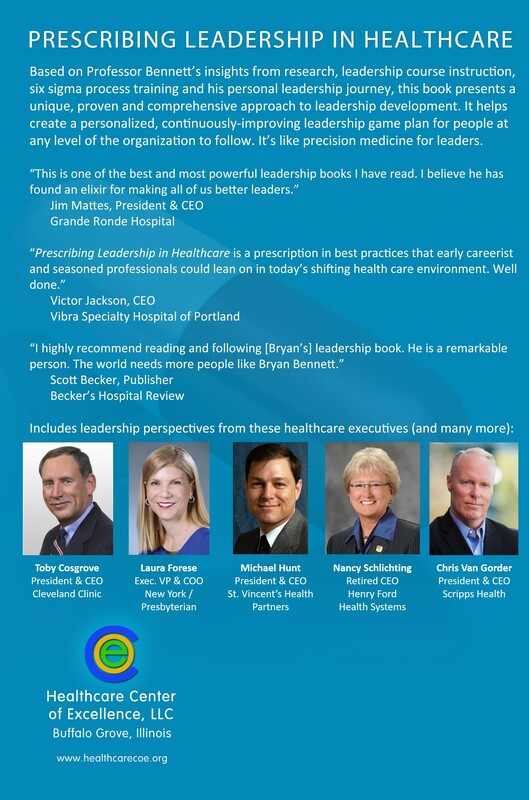 “Prescribing Leadership in Healthcare” is based on the proprietary 5-step Professional Leadership Process which creates a personalized leadership development program built on an individual’s innate qualities and strengths. It is designed as a continually improving process to help leaders at any level of the organization develop and adapt a personalized leadership vision and philosophy for utilization in their daily leadership routine. The program creates better leaders by incorporating the most often overlooked steps that research indicates are essential to better leadership development. Additionally, the book includes the leadership perspectives from interviews with top healthcare executives such as Dr. Toby Cosgrove (President & CEO, Cleveland Clinic), Dr. Laura Forese (Executive VP & COO, New York-Presbyterian), Dr. Michael Hunt (President & CEO, St. Vincent’s Health Partners), Nancy Schlichting (Retired CEO, Henry Ford Health Systems), business executives and sports champions. Professor Bennett does an excellent job providing the reader with deep healthcare leadership tactics and insight to help healthcare managers become more effective in this era of rapid change. Prescribing Leadership in Healthcare is a comprehensive view of the many factors that affect leaders in healthcare and their approach to problem solving from a proactive approach. He addresses many viewpoints that result in a single viewpoint. That viewpoint is that without effective leadership, you are bound to fail! Professor Bennett’s work should be a must read for anyone aspiring towards leadership in a healthcare position. I fully recommend this read. Bryan Bennett is one of those authors and leaders who is exceptionally inspiring to many of us every day. He is very gifted and persistent and visionary. In many ways his inspirational leadership and remarkable personal strengths remind me of certain other mentors and leaders I've had that have inspired me. I highly recommend hearing Bennett speak and reading and following his leadership book. He is a remarkable person. The world needs more people like Bryan Bennett. This is one of the best and most powerful leadership books I have read. It is a concise and practical roadmap for developing leaders. Bennett defines leadership as a process rather than a position, with leaders being both “born and made”. He relates leadership to sports and makes a strong parallel to professional athletes who must train themselves to become even better. The healthcare industry is facing dynamic change and sorely needs dynamic leaders to facilitate transformation. To develop yourself to be that kind of leader, one needs self-assessment, mentoring and practice. 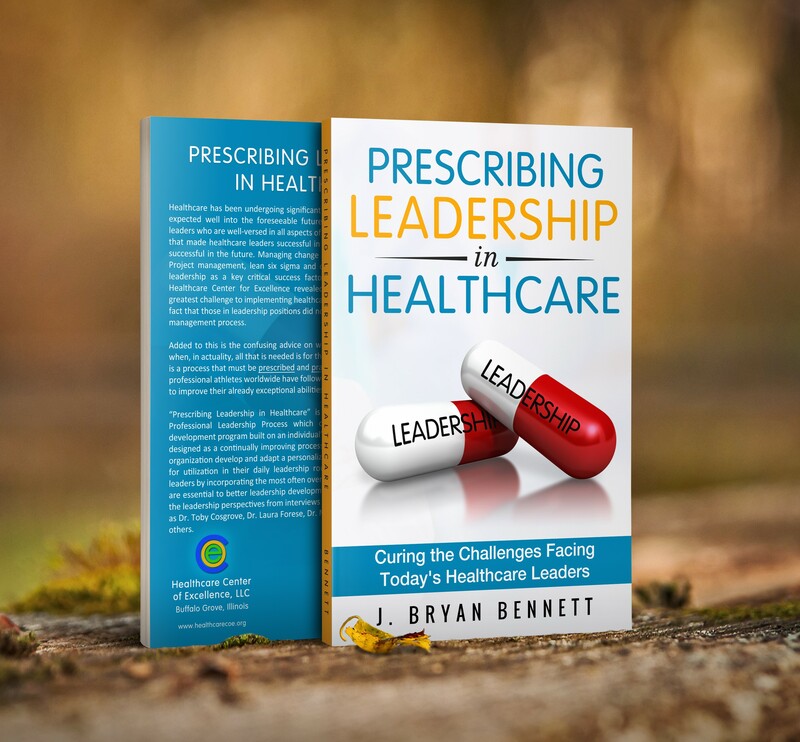 “Prescribing Leadership in Healthcare” is an excellent tool to hone God-given leadership skills and also help “make” leaders who have aptitude and desire. Bennett prescribes a process for daily leadership exercise. I believe he has found an elixir for making all of us better leaders. I highly recommend you read and highlight this book. 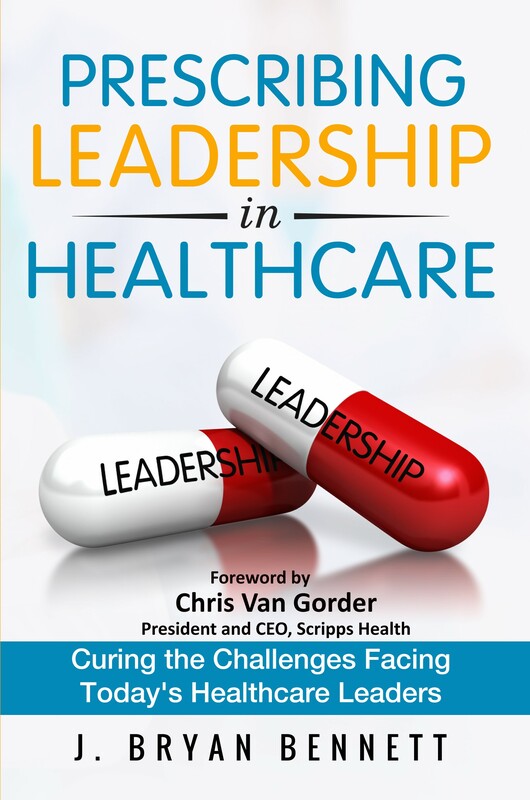 The book’s title, “Prescribing Leadership in Healthcare” says it all. Get the prescription and take it soon if you want to further your career and find success as a healthcare leader. This book is a treasure. “Prescribing Leadership in Health Care” was just that. A prescription in Best practices that early careerist and seasoned professionals could lean on in todays shifting health care environment. The analogies were seamless and clearly portrayed with relatable content. From Self Reflection to Mentoring, this book was a quick read with potent content. There were many applicable examples and a by product of this read spurred an internal conversation how I too could be a better leader. In a profession with many internal and external influences, its refreshing to have a book that pauses time just long enough to fan some flames of creatively. Well done. It is an essential tool to put the concepts from the book into action. 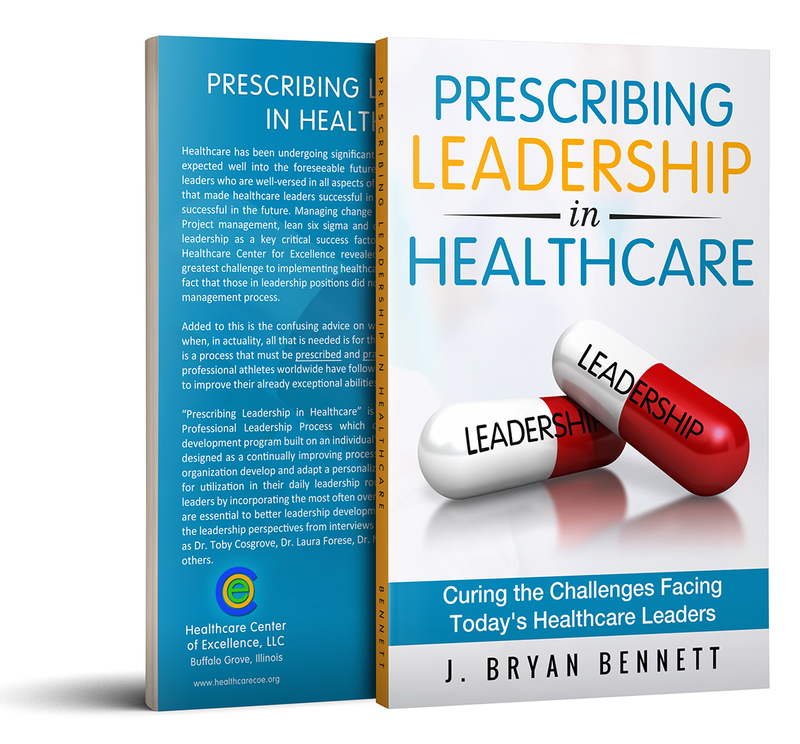 Purchase the Prescribing Leadership in Healthcare combo and receive a signed copy of the book and the Leadership Practice Workbook. Both items will arrive together after the book is published in mid-July 2017. * Off the list price of $31.90 if purchased individually. Pre-Order the Prescribing Leadership in Healthcare book and get Competing on Healthcare Analytics at 50% off!